I'm no stranger to yoga. I used to regularly attend the yoga class in my gym until I stopped going there. At home, I would practice doing poses but that was not a regular thing. The yoga I know had poses such as the Sun Salutation, Downward-facing Dog, Warrior Pose, Cobra Pose, Chair Pose and the like. Unknown to me, this kind of yoga was Yang Yoga, the opposite of Yin Yoga. 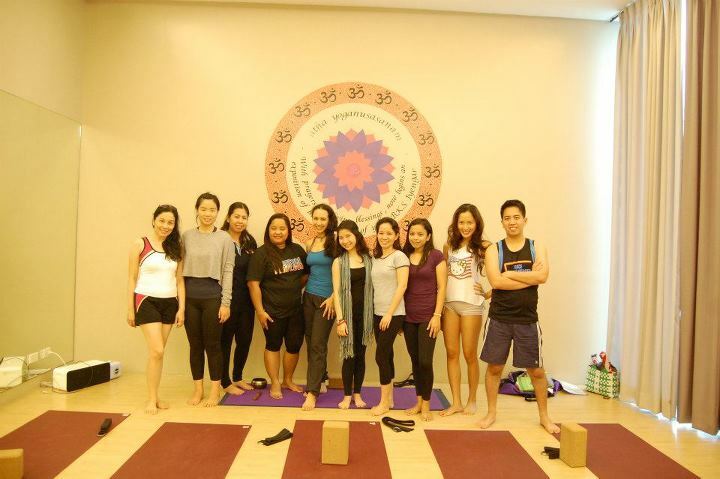 I was fortunate to be a part of a small group of bloggers who were invited to try out Yin Yoga. Yin Yoga is the calming kind of yoga. The poses are done with relaxed muscles and held for three to five minutes. As yoga instructor, Dona Tumacder-Esteban, informed us, Yin Yoga addresses the deep connective tissues of the body unlike the Yang types of yoga that targets the muscles of the body. Are you familiar with the Yin-Yang philosophy of the Chinese? Yin and Yang are not opposites but, rather, interconnected with each other. Both exist as part of a whole and one cannot exist without the other as light cannot exist without the shadow. Since almost all of us nowadays live with a very active lifestyle (Yang), Yin Yoga helps our body maintain balance. Dona explains Yin Yoga further in the handout given to us as yoga with asanas that "reorganizes the fascia, stimulates collagen and hyaluronic acid production, lubricates the joints, and allows for lymphatic drainage and detoxification." The fascia, joints, tendons, and ligaments are best accessed when the muscles are relaxed. And in doing so, the mind also relaxes. Yin Yoga is actually recommended for athletes, dancers, yogis, people under stress, and meditation practitioners. I loved it because it wasn't intimidating and the poses we did gave me my much needed stretch. Sarap! And to think I had my period the day we did Yin Yoga, ha! For more information, you can call 0917-5239663 or email inquire@igobeyondyoga.com. Beyond Yoga QC is at 3F Il Terrazzo, Tomas Morato Ave. cor. Sct. Madrinian St., Quezon City while Beyond Yoga Fort is at Bonifacio High Street Central, Taguig City. Photos courtesy of Ria Tirazona of Yapatoots.com. im glad you enjoyed your experience, mauie! hope to see you for the yin yoga workshops!! !